This is the most delicious custard or creme brulee you'll ever taste! 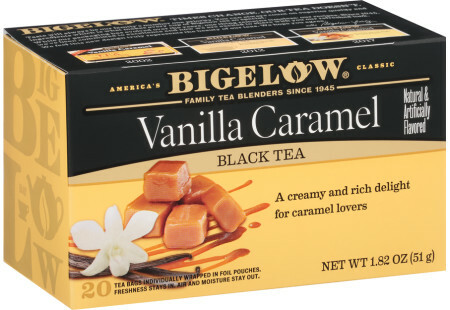 Bigelow's Vanilla Caramel tea imparts complementary notes to the bittersweet chocolate and creamy custard. If you have the torch, melt sugar on top for that final crisp sugar topping. Preheat the oven to 300ºF. Bring a kettle of water to a boil. In a small saucepan, gently heat the cream until tiny bubbles form at the edge of the pan. Add the tea bags, infuse for 4 minutes, then remove them to a small strainer and using the back of a spoon, press to extract as much tea as possible back into the saucepan. Turn off the heat, whisk the chocolate into the cream, then set aside. Combine the egg yolks with ½-cup of sugar in a medium bowl and beat until the yolks are pale yellow and slightly thickened. Slowly whisk in the cream. Divide the liquid among 6 custard cups or individual ramekins. Place the filled cups in a large baking dish. Pour enough boiling water into the baking dish to come halfway up the sides of the ramekins. Bake in the oven until the custards are set around the edge but a little wobbly at the center, about 50 minutes to 1 hour. Remove and let them cool in their water bath. Cover with plastic wrap and refrigerate for several hours or overnight. Make the sugar topping. Before serving, sprinkle the remaining sugar evenly over the custards. If you have a propane torch, heat the sugar until it bubbles and browns. Or, position the broiler rack as close to the heat as possible and broil until sugar melts and forms a hard top. Watch carefully that it does not burn. Remove and let stand a few minutes before serving. May we suggest Spiced Chai Tea - Case of 6 boxes- total of 120 teabags to pair with this recipe?